What are the Growth Stages of a Tomato Plant? Plants pass through distinct stages of development, just like people. Being able to recognize those stages can help you assess how your tomato plants are doing by comparison with others, and can guide your care and feeding of young plants. For example, fertilization that is not appropriate to a tomato plant’s stage of development can do more harm than good. The life cycle begins as the embryo within the seed coat is brought to life by the presence of warmth and moisture. A tough, pointed shoot, called the radicle--which soon develops into the root--emerges from the seed coat and turns downward in search of moisture and nutrients. As the root forms, the oval seedling leaves (called cotyledons) emerge through the surface of the soil. The seed coat is sometimes still loosely attached to one or both of these leaves as they emerge. The cotyledons spread wide to receive sunlight, and often turn a deeper shade of green as they start the almost-magical process called photosynthesis, by which plants use sunlight energy to make their own food. The central stem between the cotyledons extends upwards, and soon the first “true” leaves appear and develop. As they open, their distinctive shape reveals the identity of the plant species. The central stem continues to grow, then begins to branch as side shoots develop. Careful pruning at this stage can restrict growth to a single stem, or train the plant to twin leaders, as is often done for greenhouse tomato production. Young buds appear near the apical meristem (growing tip) of the plant and develop into a flower stem or truss. Flower petals open, and the plant moves into the pollination stage. Flying insects, particularly bees, are the most effective pollinators as they fly from flower to flower, shaking loose the pollen and spreading it as they go. Pollinated flowers develop into green fruit, which change color as they enlarge. Flowers that have been evenly pollinated will develop into nicely rounded fruits. Cold weather (below 60 degrees F., or 15 degrees C) during flowering can cause a fruit disfigurement called catfacing. Irregular watering along with a calcium deficit in the soil can cause blossom end rot, which destroys the fruit. 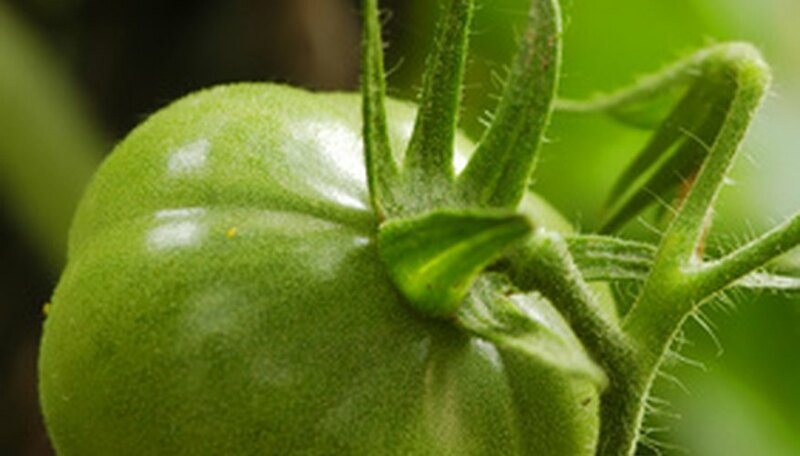 Some tomato cultivars produce fully ripe fruit which are still green, while others are yellow, pink, red, purple, almost-black dark red, or multicolored. Because of this variety, color alone cannot always be used to judge ripeness. Taste is the best guide.